For this reason the information in the label wasn't exactly soothing: 1,110 milligrams of sodium seemed like a lot. Words like "diglyceride," with a string of letters that clearly had no business sitting next to each other. It suggested that something deeply unnatural was sitting inside the box. "Obviously it's not good for me," the 20ish Holden said. "But, hopefully, I can let it slide in." Here's the thing you probably haven't stopped to consider: how the label itself is affecting you. But she does think the usual metabolic model — calories in and calories out — might need some rethinking, because it doesn't account in any way for our beliefs about our food. People don't want to think that our beliefs have influence, too, she says. "But they do!" Holden told the man he didn't want a bag. He carried his pizza out into the night. It's MORNING EDITION from NPR News. Good morning, I'm Kelly McEvers. Today, in Your Health we're looking at food labels. At the grocery store you might glance over the labels on items on the shelves, checking the amount of sugar, fat, cholesterol. Well, this story from NPR's Alix Spiegel that make you think differently about these labels and their impact. Alix begins in a grocery store here in Washington, D.C.
ALIX SPIEGEL, BYLINE: It was late, and the frozen food section of the Brookville grocery was almost deserted. There was only one person there, a man in dark clothes standing in front of a wall of icy pizza boxes. His name was Justin Holden. It's like almost nine o'clock at night and you' re coming for dinner? JUSTIN HOLDEN: It was a late night at work. I do sales, so. SPIEGEL: Oh, I see. So you're getting a frozen pizza? HOLDEN: It's cheaper than ordering delivery. HOLDEN: Twelve grams of fat, five grams of it is saturated fat. SPIEGEL: Justin had a close relative that had recently had a heart attack. In fact, Justin says that both sides of the family struggle with heart disease and that's why he always read these labels. In the back of his mind, there was this idea stalking him. If he put too much salt into his body it would eventually kill him. HOLDEN: One thousand one hundred forty milligrams of sodium. SPIEGEL: That didn't exactly seem healthy. But at the bottom of the nutritional facts under ingredients was even scarier stuff, words like diglyceride with a string of letters that clearly had no business sitting next to each other. And so conveyed the message that there was something deeply unnatural about the food inside the box. Do you think this is good for you or not good for you? HOLDEN: No. Obviously it's not good for me. But I eat out one night a week, so hopefully, you know, I can let it slide in. But I know. I know it's not good for me. SPIEGEL: Who among us has not had this moment, that kind of intimate tete-a-tete with the nutritional label searching salt, sugar, fat? Trying to discern how will you affect me, are you good or are you bad? But here's the thing you probably haven't considered. How does the label itself affect you. SPIEGEL: This is a psychologist named Alia Crum who works at Columbia University. And a couple of years ago, she found herself seriously considering what on it's face seems like a pretty strange question. She wanted to know whether the information in a nutritional label could somehow change what happens to you biologically. CRUM: Whether these labels get under the skin literally, so they don't just effect perception and taste and behavior but actually effect the body's physiological processing of the nutrients that are consumed. CRUM: Says zero percent fat, zero added sugar, and only 140 calories - guilt free satisfaction. 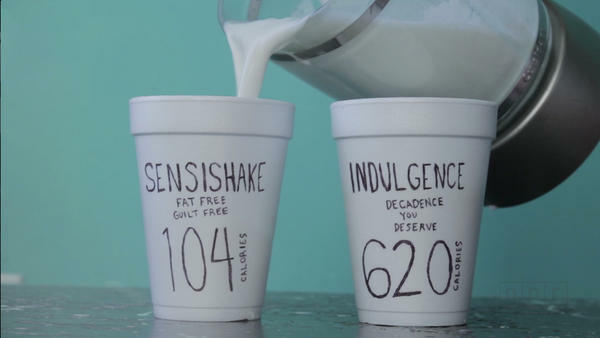 SPIEGEL: And then both before and after the people drank the shake - which, by the way, was actually a 300 calorie shake - nurses monitored their levels of this hormone called ghrelin. CRUM: Ghrelin is a gut peptide. It's secreted in the gut. People in medical field call it the hunger hormone. SPIEGEL: Basically, when you haven not eaten anything, ghrelin levels in the stomach rise which signals to the brain that it's time now to seek out food. CRUM: Hamburger with cheese and French fries and a milk shake, gherlin levels are going to drop a lot. And what that does, is it signals to the mind, you've had enough here, you know, and I'm going to start revving up the metabolism so we can burn these calories were just ingested. SPIEGEL: On the other hand, say you only have a small salad, your ghrelin levels wouldn't drop that much. CRUM: They maybe would just drop a teeny bit. And what that would signal is, you know, a combination of, mm, I'm not feeling physiologically satiated, maybe you need to eat more food. SPIEGEL: And the metabolism doesn't get revved up in the same way. Now for a long time, the idea has been that these fluctuations in ghrelin levels were responses to the actual nutrients that the ghrelin met in the stomach. So put in a big meal, ghrelin responds one way; put in a small snack, ghrelin responds another. The thing that was believed to be important was the actual content of the food - not your beliefs about that food. CRUM: The label wouldn't matter. CRUM: The ghrelin levels dropped about three times more when they were consuming the Indulgent shake - or thought they were consuming the indulgent shake - than when they were consuming the sensible shake or thought they were consuming the sensible shake. CRUM: That's a big difference. Yeah. It's both statistically significant also, you know, practically meaningful, considering that it was three times the drop. SPIEGEL: Which, at least for me, raises a pretty profound question. So does that mean that the facts don't really matter, it's what we think of the facts that matter? CRUM: I don't think I would go that far yet. There's a lot more tests that we need to do to figure out, you know, how much do the nutrients matter and how much does our mindset matter? CRUM: Our beliefs matter virtually in every domain, in everything we do. How much is a mystery. And I think that we haven't given enough credit to the role of our beliefs in determining our physiology, our reality. You know, we have this very simple metabolic science; calories in, calories out. People don't want to account for the fact that our beliefs matter too. But they do, and we're finding that more and more the more that we research and explore these topics. SPIEGEL: After he finished in the frozen pizza section, Justin Holden wandered a couple isles over and got himself a bright blue sports drink to go with it. The liquid almost glowed under the lights of the store as he put his stuff on the conveyor belt in front of the cashier. HOLDEN: Thank you. No. I'll carry it. Thank you. SPIEGEL: Holden didn't want a bag. When he was done he just picked up his dinner and tucked it under his arm and went out into the night. Within an hour, the pizza would be in his stomach, mingling there with a set of beliefs that he got from the back of a box. GREENE: It's MORNING EDITION from NPR News. Transcript provided by NPR, Copyright NPR.